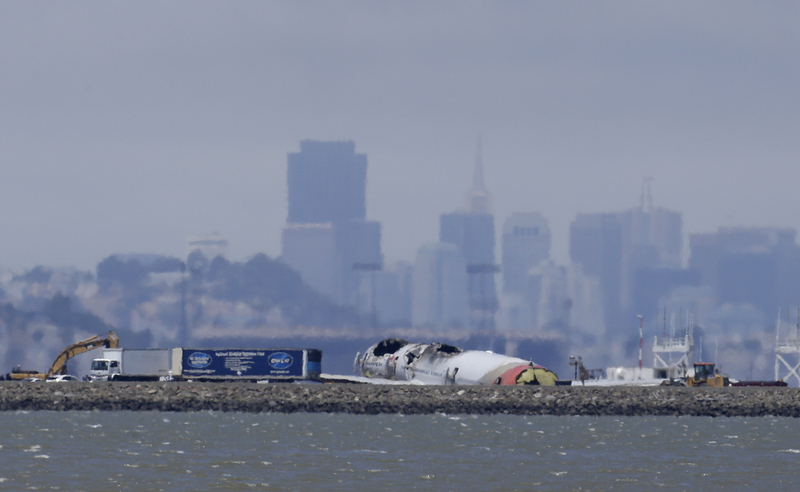 SAN FRANCISCO The National Transportation Safety Board said Thursday the engines and automatic flight controls were working normally on Asiana Airlines flight 214 that crashed at San Francisco International Airport on Saturday. As CBS News correspondent John Blackstone reported, NTSB investigators have found no evidence on the plane's flight data recorder of any problems with the mechanical parts or the electronics on the aircraft in the last moments before the crash, which killed two people and injured many others. "The engines and the flight control services appear to be responding as expected," said NTSB chairman Deborah Hersman. "There is no anomalous behavior of the autopilot, of the flight director, and of the autothrottles." During the first five days of the NTSB investigation, Hersman has said repeatedly that pilots Lee Gang-kuk, who was landing the big jet for his first time at the San Francisco airport, and Lee Jeong-Min, who was training him, were ultimately responsible for a safe landing. Investigators have stressed that nothing has been definitively ruled out and no firm conclusions reached. The NTSB team will soon head back to Washington with "a mountain of information" to analyze and review, from pieces of the airliner to interview transcripts, and agency's final evaluation is expected to take more than a year. Hersman clarified Thursday that the pilot trainee told investigators he saw a flash of light at about 500 feet, which would have been 34 seconds before impact and the point at which the airliner began to slow and drop precipitously. She said he told investigators that the light did not prevent him from seeing his instruments, and that it may have been a reflection of the sun. The other pilots made no mention of a light, she said. Hersman also said there were two calls to abort the landing, the first came about three seconds before impact, the second, from a different pilot, about 1.5 seconds later. While the pilots were manually flying the jet for the landing, as expected on a clear, sunny day, they told investigators they thought the airliner's speed was being controlled by an autothrottle set for 157 mph. Inspectors found that the autothrottle had been "armed," or made ready for activation, Hersman said. But investigators are still determining whether it had been engaged. In the last two minutes, there was a lot of use of autopilot and autothrottle, and investigators are going to look into whether pilots made the appropriate commands and if they knew what they were doing, she said. Even if the autothrottle malfunctioned, Hersman stressed, the pilots were ultimately responsible for control of the airliner. "There are two pilots in the cockpit for a reason," she said. "They're there to fly, to navigate, to communicate and if they're using automation, a big key is to monitor." When the pilots realized the plane was in trouble, they both reached for the throttle. Passengers heard a loud roar as the plane revved up in a last-minute attempt to abort the landing. Experts said the evidence points toward pilot error. Lee Collins, a pilot with 18,000 hours and 29 years of experience on a variety of airliners, said the question is how the Asiana pilots could make such a "gross error." "What caused this airplane to crash was their failure to maintain proper airspeed," Collins said. Some of the passengers from the aircraft, along with family members of the injured, were taken for a closer look at the wreckage late Wednesday. Some were dressed in white, the traditional color in Asia for those in mourning. Ben Levy, who suffered minor injuries in the crash, went with his wife. He realized now how much risk was involved. "Every second counted," he told Blackstone. "But on the other hand, I think it was a blessing not to know...because that prevented panic." So little panic that one of the first passengers to call 911 seems strangely calm. "Hi uh," said one caller, "we just we're at the SFO airport and our airplane just crashed upon landing and I think we need somebody here as soon as possible." But the 911 calls released show concern growing as the injured waited for medical help. "There are people injured on the tarmac," according to another call. "Seriously injured. There are no ambulances." Fire officials say to avoid chaos at the crash site, ambulances were held at a staging area as rescue crews assessed the injured. For those waiting for help, however, the minutes stretched on. "There is a woman out here on the street, on the runway, who is pretty much burned very severely on the head and we don't know what to do," said a caller. "She is severely burned, she will probably die soon if we don't get help. Authorities are investigating whether one of the two Chinese teens who died may have been run over by a fire truck rushing to the burning jet. The NTSB has now turned the runway back over to the airport, but there remains a lot of cleanup to be done before the runway can be reopened, Blackstone reported.